Mitt Romney’s three-country overseas trip revealed a Republican candidate whose foreign-policy ideas are either mysterious or reckless. Mitt’s world tour revealed more than his gaffes. His foreign-policy ideas are actually quite scary. Photograph by Uriel Sinai/Getty Images. Mitt Romney is back home from his three-country world tour, and the question must be asked: Has any presidential candidate—has any American politician of stature—splashed in so many muddy puddles along the way? Looking back at the voyage, the “gaffes” in London (which weren’t so much gaffes as revelations of Romney’s character) turned out to be not the afterburn of jetlag, as some of his aides suggested, but rather a preview of coming attractions. Jerusalem should have been as easy as London should have been. There’s a time-honored shtick for politicians’ visits to the Holy Land: don the yarmulke, slide a note into the Wailing Wall, make a speech about the grave threat from Iran and America’s unshakeable commitment to Israel, bask in the applause, and off you go. Much has since been written about the ensuing uproar, especially from Palestinians, who found the remark racist (though less than I would have thought from members of my own tribe, who usually bristle when a Gentile swoons over their knack for making money). Culture does have some bearing on the issue. But it takes a certain kind of blindness not to see—or, in Romney’s case, not to mention—the role of occupation and blockade in the thwarted progress of Palestinians, a creative and well-educated people. 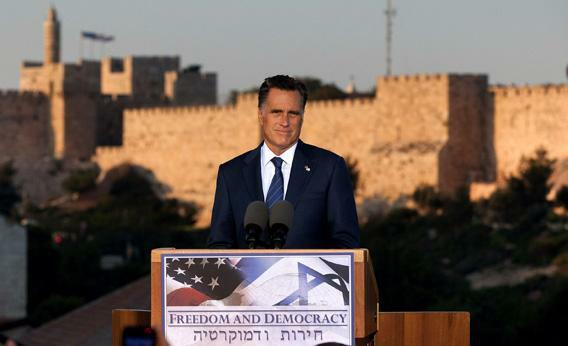 Romney later said that he “did not speak about the Palestinian culture,” but of course he did. If someone says whites are better off than blacks because of culture, they are very clearly talking about black culture as well as white culture. This leads to another, more vital question that the Romney trip raises: Does the candidate believe the things he says? Has he thought through their implications? Or is he simply pandering to the audience of the moment? In other words, is he shallow, or is he cynical? It’s an important question for someone who’s campaigning hard to be president. Romney took this trip to pass a fairly simple test: to demonstrate a bedrock comfort and competence on the world stage. He failed that test, so he should at least be clear about another trait worth knowing about a presidential candidate: his beliefs. In Romney’s case, it’s still a mystery what they are. If he really believes that Israelis are superior to Palestinians (and, let’s not mince words, that is what his remarks amounted to), what does that imply for the prospect of Israeli-Palestinian peace talks in a Romney administration? If he believes that “the hand of Providence” led Jews to the Promised Land, how does he define that land? Does it include what some right-wing religious Jews call “Greater Israel,” and if so, does he therefore support the expansion, or at least oppose the restriction, of settlements? Then there was his pledge to recognize Jerusalem as Israel’s true capital and to relocate the U.S. Embassy from Tel Aviv. Does Romney know that every American president, dating back to Harry Truman, has declined to take a position on Jerusalem’s status precisely because it’s in dispute (at the time with Jordan)? Or that the Oslo accords of 1993, in an update of this acknowledgment, stated that the city’s status must be resolved through Israeli-Palestinian negotiations? In short, does Romney realize that he’s promising to overturn 64 years of U.S. foreign policy, the 19-year-old Oslo accords, and the basic premise of a two-state solution (which most Israelis favor)? A puzzling notion has taken hold in the American press, including most recently in an otherwise thoughtful New York Times article by Peter Baker, that Romney’s views on foreign policy are barely a hair’s breadth of distance from President Obama’s, that they differ more in “degree and tone” than in substance. This is nonsense, on several grounds—and the Romneyshambles tour underscored the contrasts. Second, there are many crucial issues on which the two disagree profoundly. Romney has denounced Russia as America’s “number-one geopolitical foe” and assailed the New START arms-reduction treaty as a danger to national security. U.S.-Russian relations aren’t without their tensions, but the realms of cooperation opened up by Obama’s “reset” policy—on trade, counterterrorism, nuclear nonproliferation, Iranian sanctions, among others—are well worth preserving. Romney has said he would declare China to be a “currency manipulator,” which could well unleash a trade war that we cannot afford. He has called for spending 4 percent of GNP on the military, as distinguished from Obama’s 3 percent, without saying how he would spend it or where he would get the extra $1 trillion over the next six years. This is a very different stance from current U.S. policy. Obama has sent his top military officials to Israel several times, has made repeated assurances to Prime Minister Benjamin Netanyahu, and has re-upped security assistance to the Israeli Defense Forces, precisely to dissuade Israel from attacking the Iranian nuclear sites on its own. The Joint Chiefs of Staff have war-gamed this scenario, and have told their Israeli counterparts the results: Israel, they say, may have a good first couple of days, then their world goes to hell—multiple terrorist attacks, a cut-off of oil supplies, a strengthening of the mullahs’ regime, and (this is the twister) a resumption of Iran’s nuclear program within a few years. So in comparing Romney’s foreign policy to Obama’s, a more accurate formulation might be: They’re the same, except when Romney’s is more reckless or mysterious. Not a good bumper sticker.